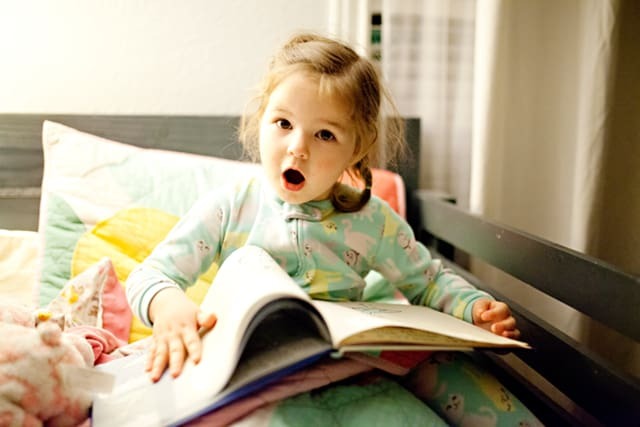 Most of us leave read-aloud time for bedtime, but if your kids’ bedtime routine is anything like my kids’, by the end of the day you’re burned out. I don’t want anyone touching me or asking me for one more thing, and I certainly don’t feel like adding 20 more minutes to our already long and drawn out bedtime process. How to Fix It: Try moving your read-aloud time earlier in the day. You could read while your kid eats breakfast or an afternoon snack, or during bathtime if you’re not completely pooped by then. As another strategy, make sure you’re reading a book out loud that you enjoy, too. If you’re stuck reading the same picture books every night, try branching out to a chapter book you enjoyed as a kid or a new release you’ve heard of. Or if you think you can swing it with your kid, try reading out loud from whatever book you’re currently reading. Obviously you’d need to skip over any kid-inappropriate bits, but maybe they’ll go for it, and you can squeeze in a little reading before you’re in bed yourself. 6. My kids are all different ages. This can be tough. My kids are 10, 5, 3, and newborn. I can read a picture book to the younger three, but that leaves out the oldest. Or I can read a chapter book to the two big kids, but that leaves out the two little kids. How to Fix It: What I’ve discovered is that my 10-year-old still enjoys listening to a good picture book, and I’ve heard from other parents that even their teenagers still love hearing them read picture books out loud. But if your older child really isn’t interested, try reading interesting magazine or newspaper articles out loud to her while she’s eating or doing chores. You might say, “Hey, check this out! I thought you might like this…” And then just start reading. As another idea, you can read out loud to your older kids when the younger ones are in bed at night or while they’re taking a nap. 7. My kid interrupts…on every page. Nobody likes to be interrupted – especially not when you’re trying to do something for your child and she interrupts you. How to Fix It: If your child’s question is about the story itself, go ahead and answer it right away because odds are, your child isn’t fully understanding what’s happening and that’s why she asked. 8. Reading the same story over and over again is boring. Yes, it is. It really, really is. If there’s a book you truly hate, get rid of it. Or at least hide it most of the time. It does your child no good if you’re gritting your teeth just to get through a book you hate. Better to spend 15 minutes reading something you enjoy than zero minutes reading because you can’t stand a particular book. Find something you enjoy instead using this list of the best picture books. If there’s a book you actually do think is alright but you just don’t want to read it 72 times a day, try coming up with a rule for your house. For example, when I’ve read the same book twice in one day, my kids know that book is done for the day. There’s no shame in setting boundaries so the read-aloud experience can be enjoyable for everyone. 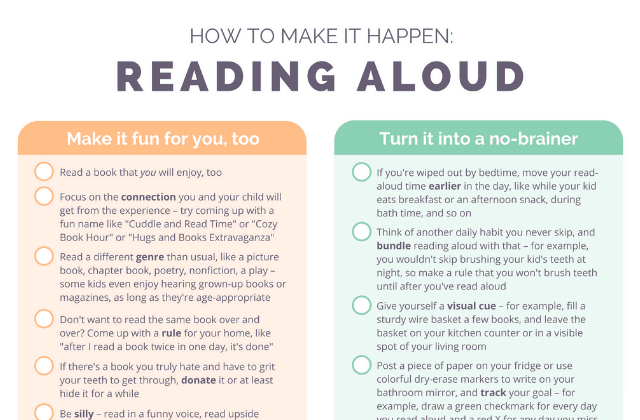 Try keeping things fresh with every read-aloud of a repeat book. One time, you might read it with a Southern accent. Another time, you might read it while marching in place. (Make your kid do this too!) Or another time, you might lay upside down hanging off the couch to read it. When your sanity is at stake, feel free to be creative. Visit the library regularly to get fresh new books. 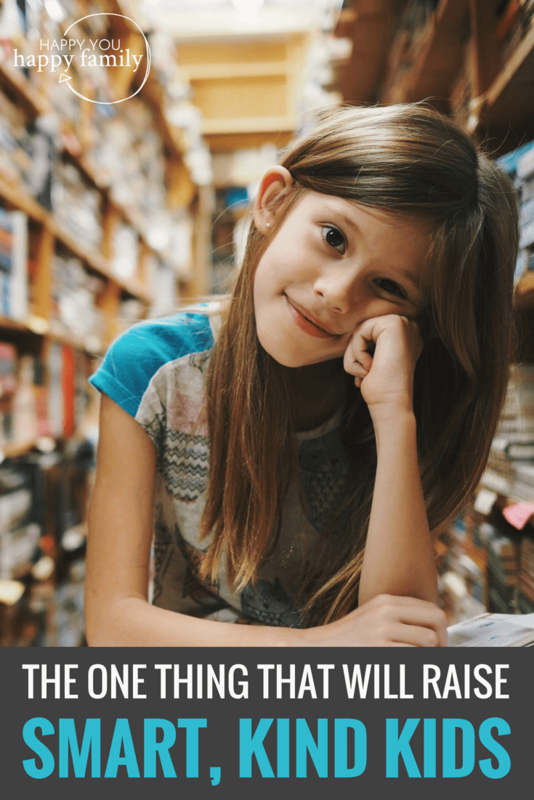 When you have a steady influx of new books to choose from, your kids will be less focused on re-reading the same books over and over again. Bonus: When the library books are due back to the library, they go back and you never have to re-read them again! 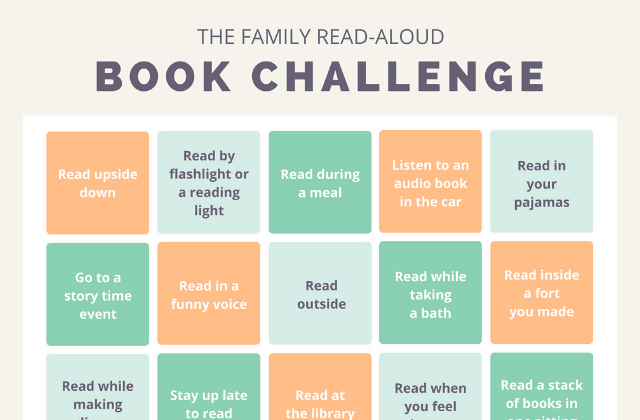 One way to make reading aloud more doable is to turn it into a game, so I designed a free printable read-aloud challenge you can start today with your family. Your kids will love it, and so will you! Print the challenge board + cheat sheet. Any paper will do the trick, but card stock would be nice and sturdy. Hang the challenge board somewhere visible like your fridge or your living room wall (next to the TV works great!) as a visual cue to remind you to squeeze in read-aloud time. Challenge yourself to try one new read-aloud trick a day for 30 days. But if you don’t get it done in 30 days exactly, no worries. Every day you read aloud to your kids is a win. 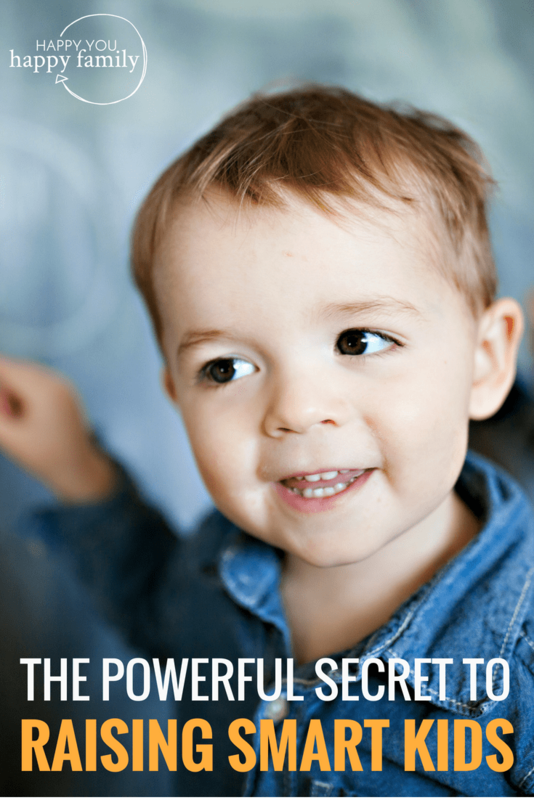 What gets in your way with this habit for raising smart kids? Share in a comment below! This is so true! I used to watch educational shows and read so much as a child! Looking back, I think that’s what made me ace my school exams year after year, beating out the entire class every time. Well, I can see that I really need to buckle down and read to my son more. Several times a week is not cutting it because he seems to have some trouble settling down to pay attention. I need to help him learn to focus and listen. The kid is very high maintenance. A normal book doesn’t work as well with him. He is more inclined to look at (although briefly) a book with pull tabs, when if pulled,the animals open their eyes or flap wings and so forth. I’ll strive for everyday now. LOVE this article!! I’m a kindergarten teacher of 26 years and also a mom of twin boys (who are now 20) that I read to even when they were in middle school. I emphasize to my kindergarten parents each year how important this ONE simple and enjoyable thing is. I’d love to print this – do you know if there’s any way to just get the text without the ads so that I could share with my parents and other teachers? I am also a K teacher and would also love this article! Can you tell me where I can get it without the advertisements? Thanks so much!! Hi Sue, if you go here and click the link inside the yellow box labeled “For teachers”, you can get a printable copy of the article that’s licensed for sharing with 30 students’ families: https://happyyouhappyfamily.com/raising-smart-kids/#teachers Hope that helps! I still read aloud every evening to my 7 and 9 year old. We’re out of traditions picture books and reading the gorgeous illistrated Harry Potter books at the moment. Our routine is that we each take turn one night picking a book, including me the parent! And I’ve always said Sorry kids I’m not rereading the same book twice in a row… so I’ve always enjoyed our evening reads:-) I gradually learned to let go and read with voices and have gotten better at it! Amazing article Kelly. Loved every single sentence and especially the ‘How to fix it’ section. Fabulously written and so so important! God bless. The books I love to read the most are ones that can be sung!!! And my grandchildren love them! The first book I ever sang to my grandson was “The Itsy Bitsy Pumpkin” and I’m sure you can guess the melody! He just turned three and it is still his favorite book! Please suggest good beginning chapter books. My 6 yr old grandson is ready for more complicated stories and loves Captain Underpants…but I am not a fan. The language used is considered “inappropriate” in his public school so I don’t want to model/encourage that vocabulary. Have you tried the Magic Treehouse books by Mary Pope Osbourne? I think they make good beginner chapter books. Other favourites of mine are the Paddington books by Michael Bond, Ramona, Henry Higgins and other books by Beverley Cleary, the Ghosthunter series by Cornelia Funke, Harry the Poisonous Centipede series by Lynne Reid Banks, Pippi Longstocking books by Astrid Lindgren. Many of the books I’ve mentioned are oldies but goodies and have aged well. Also, a visit to your local library and a chat with the children’s librarian there can provide lots of choice at no cost to you. Other “oldies” (not as well known) that my children loved are by Edward Eager. We began with “Half Magic,” written in 1954, and went on from there. They are great for read-aloud, but our first introduction was Half Magic on audio tape in the car. (Yes, it’s been a while) It had my kids laughing hysterically. I even checked it out to use with a young developmentally and physically disabled adult I occasionally cared for at home. He was stuck watching his mother’s shows every day he didn’t go to “school.” He enjoyed it also. Awesome article. I read a LOT to my own daughter, and dozens of day care kids. I would love to read to my grandbabies every day, but they are too far away. I’d appreciate some suggestions to make reading to them over social media/video/youtube in a manner that is at least somewhat personal..